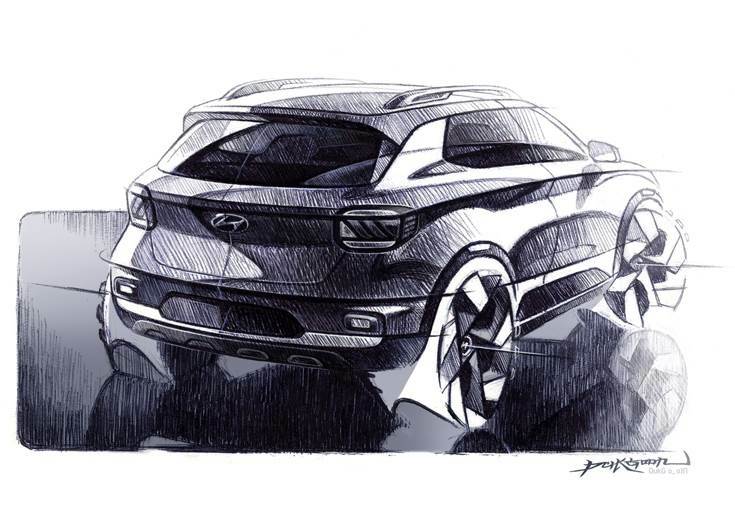 Hyundai Motor has released the first official design sketches of the Venue SUV, which is set to have a simultaneous global reveal at the New York Auto Show on April 17 as well as in India. 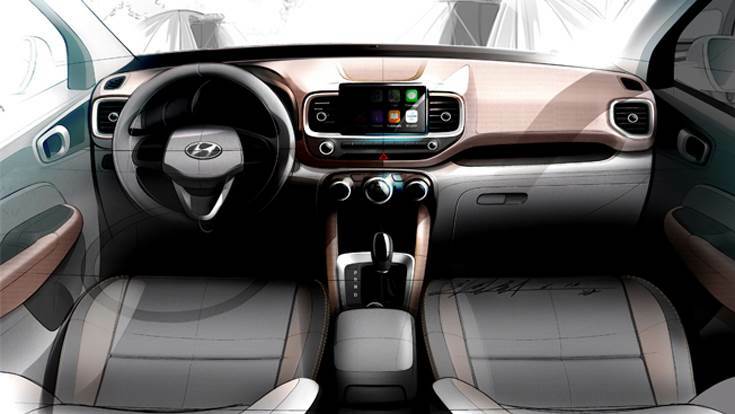 The sketches help give a clearer idea of the new Hyundai. Look past the exaggerated wheel arches and oversized wheels of the rendering and what you see see is an SUV with a chunky and squat stance. Hyundai’s cascading grille occupies prime space up front and should come embellished in chrome. The Venue’s dual headlamp setup that comprises slit-like lights up top and the main headlight lower down is also seen. Squared-out DRLs that surround the main headlights were one of the style bits seen in an earlier teaser. Blacked-out A-pillars and roof rails are other elements seen in the design sketches. Styling at the rear has been kept relatively simple and elements such as the squarish tail-lights add robustness to the look. Auxiliary lights, perhaps reflectors, are also seen lower down on the bumper and there’s a hint of a scuff plate too. Of the other things, it is already known that the Hyundai Venue will come with the option of a sunroof and diamond cut alloy wheels. Spy images have revealed much of the Venue’s cabin though the interior design sketch gives a clear view of what’s to come. The dashboard is fairly straightforward in look though there is a promise of the cabin being a user-friendly space. The infotainment system’s touchscreen sits high up and in clear sight, the climate control dials are chunky, there’s seemingly a storage space under the centre console and there’s even a recess above the standard glovebox, that’s been shown holding an umbrella in the dash sketch. Like other Hyundai models for India, the Venue too sports a flat dash top which could be uses as a place to host idols. An interesting detail is a rotary controller under the gear lever that perhaps provides another way to access the infotainment system. 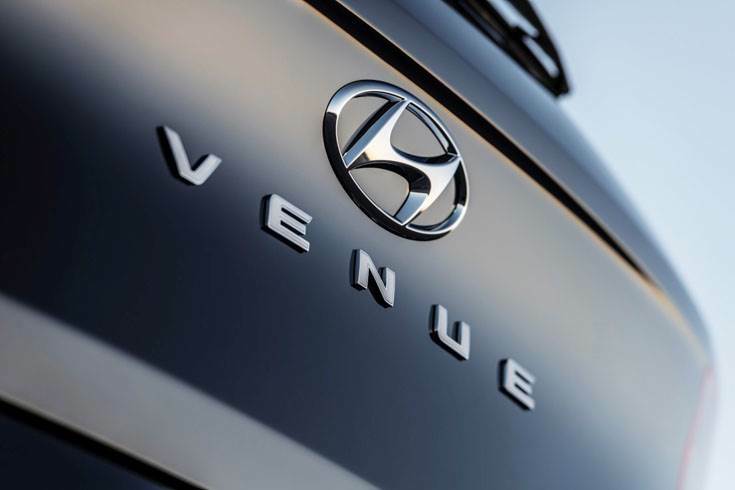 Hyundai has already announced the Venue’s connectivity features in the past. There's also a hint of paddleshifters suggesting the automatic version could get this class-first feature. The Hyundai Venue will come with the option of a 1.4-litre petrol and diesel engines as well as a 1.0-litre turbo-petrol unit that will come with a dual-clutch gearbox. The Hyundai Venue will go on sale in May 2019 in India. While final pricing will only be known at launch, the Venue is unlikely to come cheap. Expect pricing in the range of Rs 800,000-12 lakh (estimated, ex-showroom). Hyundai Motor India's answer to the Mahindra XUV300, Maruti Suzuki Vitara Brezza and Tata Nexon, is scheduled to be launched in mid-May.